Deer Creek Days in Glenrock Wyoming at the park. We are set up here at Deer Creek Days in Glenrock Wyoming with the Plains ice cream wagon. Come enjoy some ice cream and cotton candy and help us fill our pantries around Wyoming! Set up at the ranch rodeo in Glenrock Wyoming. We have ice cream to cool down with and cotton candy for those with a sweet tooth. Get your second wind for the street dance! We are set up here at the Glenrock Wyoming Deer Creek Days. We are serving cold ice cream on the Plains Gift Shop ice cream and cotton candy wagon. Come enjoy some ice cream and cotton candy. Help us fill our pantries around Wyoming! Thanks..
Last Douglas Wyoming First Thursdays. We are at First Thursdays down town Douglas, A portion of the proceeds will be going straight to the Falkenburg family. Come help us help others and cool down with some cold ice cream and cotton candy! This will be our last First Thursdays for this year.. Will for sure see you next year. The tornado that hit above Douglas Wyoming hit a local families ranch. The Falkenburg’s are a great part of this community and we would like to help them out. I imagine insurance covers some but not all. All donations received through heretohelpwy.org/donations from now to friday the 2nd will go to the Falkenburg’s to help with this disaster. This morning we were in Lusk, Wyoming to set things up for the placement of their first open box pantry in the county of Niobrara at the Best Western Pioneer Motel on Main Street Lusk Wyoming. Pantry is located a few steps south of the Best Western Pioneer Motel right here on Main Street in Lusk. Thank you Tom and Best Western Pioneer Motel for providing the location for the Open Box Food Pantry.. Thank you Jerry’s Welding Service for your contribution. Your donations made this all possible. 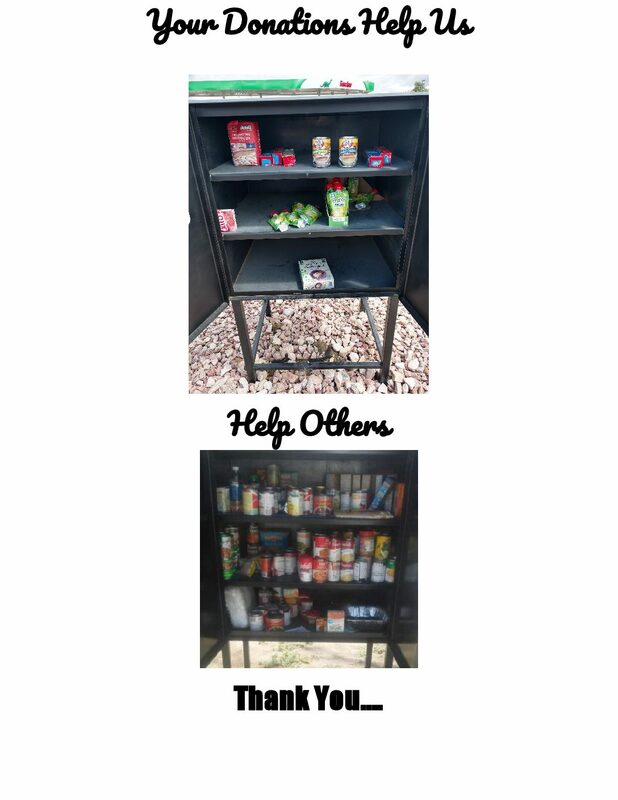 best part, adding food items for those who may need them. All done.. Just a few finishing touches and some shine. Stop by and give us a look. Thank you everyone for your support. Hope to see you there. Sitting here and counting my many blessings. 99, 100, 101 …. 110. 4th of July is one of them. Here To Help Foundation of Wyoming asking you to drive slow. Be safe.. Fasten that seat belt. Arrive alive. From all of us to all of you.. Have a safe and happy 4th of July. We and the community are so thankful for your support and encouragement. Thank you. Was looking at the weather forecast on KCWY News 13. Our thoughts are with the men and women still up there working the fire. Gosh I can’t imagine what the men and women are having to go thru as they continue working on the Badger Creek Fire west of Laramie. Just wanted to throw out a really big thank you to the men and women on the fire line. Your service, hard work getting the job done is greatly appreciated. Thank you! Douglas, Wyoming has been concerned for those who have been touched by the effects of the Badger Creek Fire. We wanted to help out the young women and men on the front line as the fire went from a few acres to many thousands of acres. Here To Help Foundation of Wyoming has started a fire donation drive to collect items to help the fire fighters. Through word of mouth and social media the wave has started. When we arrived in Laramie we found that the authorities had closed the roads and access to the fire camp was not possible. We attended a meeting that took place at the Laramie Fair Grounds. Rocky Mountain Incident Management Team provided information to the public and those who have been effected by the fire. Details concerning fire fighting progress and information for those who had to be evacuated. After the meeting I ran into a local volunteer fire fighter who had set up facilities at his shop where donations could be dropped off. Thank you Tracy for helping us get our donations to the fire camp. Thank you and those you serve with for your much needed service. Lockup For Charity Detention Status. Managed to make it through detention with out any time added for bad behaviour. We were glad to get those cuffs off. Release went thru without a hitch execpt for all the paper work involved. After the sheriff took the handcuffs off we managed to get some nice pictures of this eye opening experience. What a fun day at the Joint Justice Center in Douglas, Wyoming. We really appreciate all of the donations and emotional support during our time in lockup. Thank you to the officers and staff of the Converse County Sheriffs Office. You made this event fun and very informative. You really have a nice state of the art facilities to work in. Koltons Karnival. A really big thank you for providing all the yummie food. Biscuits and gravy, pancakes and coffee were awsome and very very much apprecialed. Thank you. Believe me.. It wasn’t easy.. Some can take it. Some cant. We are depending on family, friends and sponsors to get us out of JAIL. SHOUT! Attend.. It will be fun. Would you go to jail for your favorite charity? We would and we are. Our release depends on the bond money you can provide. Your donations gets us out so we can continue our very important mission. SHOUT: Donations Delivery to Fire Fighters Badger Creek Fire. Our truck and trailer will be leaving the collection site at the Plains Restaurant and Motel on Richards Street Douglas, Wyoming at noon tomorrow 06/16/2018. We will deliver your donations to provide help to those affected by the Badger Creek Fire. Delivering things they need to get thru this very difficult time. Lets get as much as possible on the truck and trailer. This will really help our guys and gals who are battling this fire. Appearances indicate they may be fighting this fire for some time. Any thing you can help with would be greatly appreciated. Cash donations can be made here or in our donation box at the Plains Restaurant and Motel on Richards Street. Suggestions : bottled water, Gatorade-type drinks, lip balm, eye drops, sunscreen, bug spray, wet wipes and other toiletries as well as snacks such as granola bars, fruit snacks and fresh fruit.